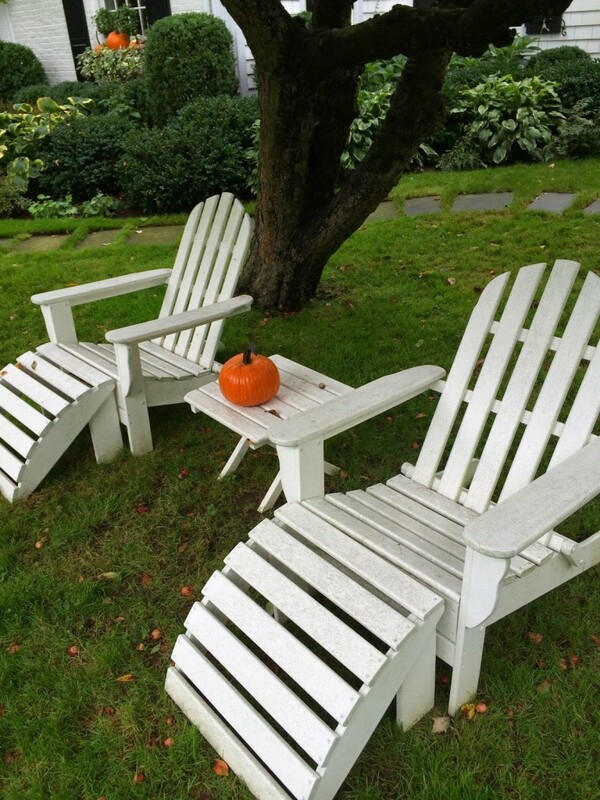 Hey, Fall….pull up a chair and stay a while! I have come to love this season, more than I ever did as a child. I think it was because the Texas version of Fall is leaves turn brown and fall off the trees. Just not nearly as spectacular as it is in the Northeast. Even the cooler temps are a treat. I can remember trying to wear my new sweaters to a football game, only to be sweating underneath. 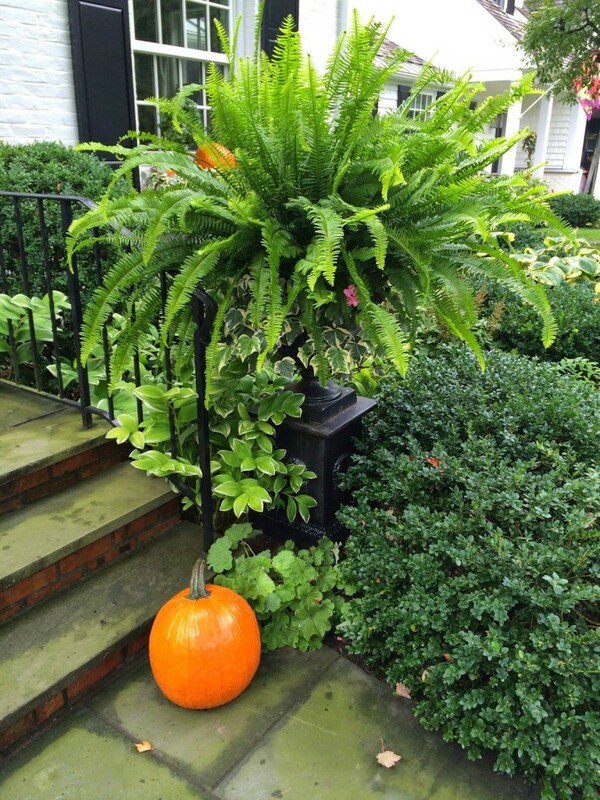 Keeping all of our existing window boxes and pots as is, with just the addition of seasonal pumpkins, helps welcome this new season. 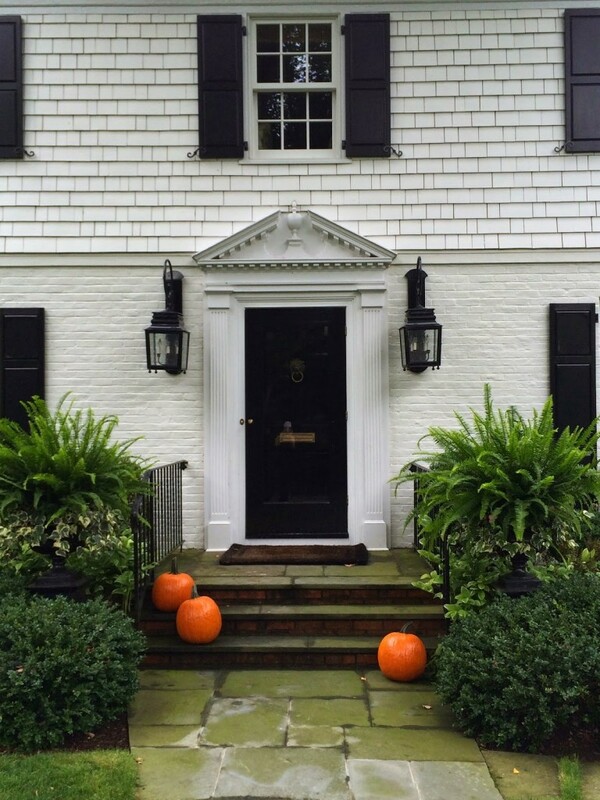 I love white pumpkins, but they don’t pop against my house like the orange ones. In fact, it’s about the only time you’ll see orange at my house. « Let’s Go to Paris! I am happy to say I have that problem also! I love a white house! WOW. I AM IMPRESSED! Dearest Elizabeth, your home is strikingly GORGEOUS! I have always loved white painted brick, and if my husband said the word, I'd have our brick cottage painted white ON THE SPOT! But I do love it the way it is now…. The photos you share are so crisp and glorious; they are inviting fall with such grace! Thank you so much for coming to leave a comment! Enjoy your day and so good to hear you have a little one left at home…10 years old? Oh, I used to teach that age. The perfect age. OK that could not look any prettier Elizabeth…just beautiful and so utterly charming! LOVE IT! 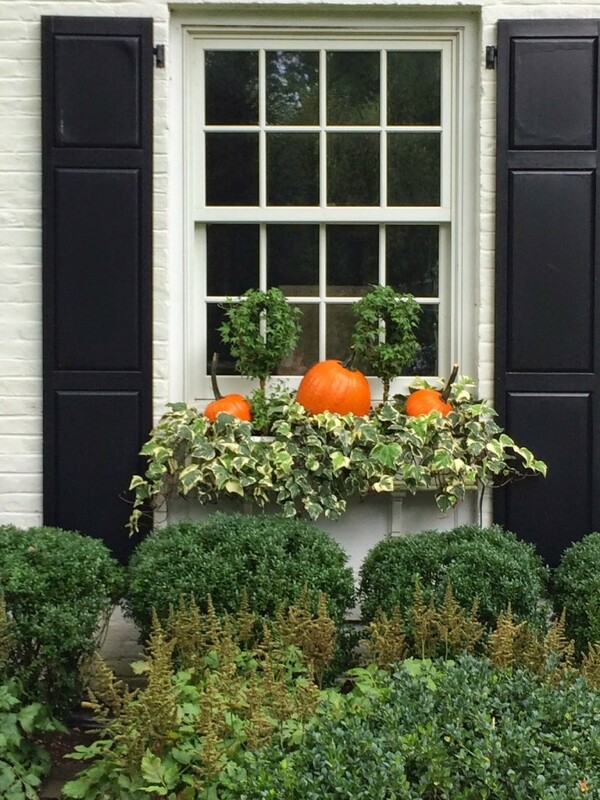 The window boxes and topiary urns in particular are so fabulous….fall is my absolute favorite, no season excites me quite like fall does. Hope yours is off to a wonderful start! Elizabeth, you are inspiring me. Fall hasn't come to my house, yet, but you have me ready to go collect some pumpkins! Fall often means rain (that lasts until March) in the Pacific Northwest, so it's hard to say goodbye to summer. But I love all the seasons and fall brings beautiful color displays, cozy sweaters and warm pots of soup on the stove. So many wonderful reasons to love autumn! The first time I spotted your home on Eddie Ross, I thought oh how lovely with the pretty pink tulips and now with those orange pumpkins, I love it too. Now as fas as "sweating", ladies "perspire" my dear. I think of was Diana Vreeland who said that….or Chanel. 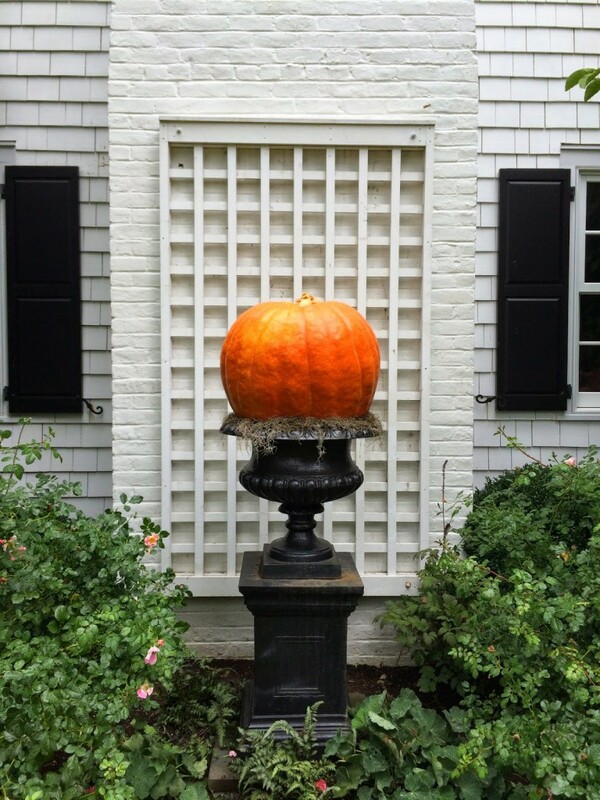 Happy Autumn to you and your home! 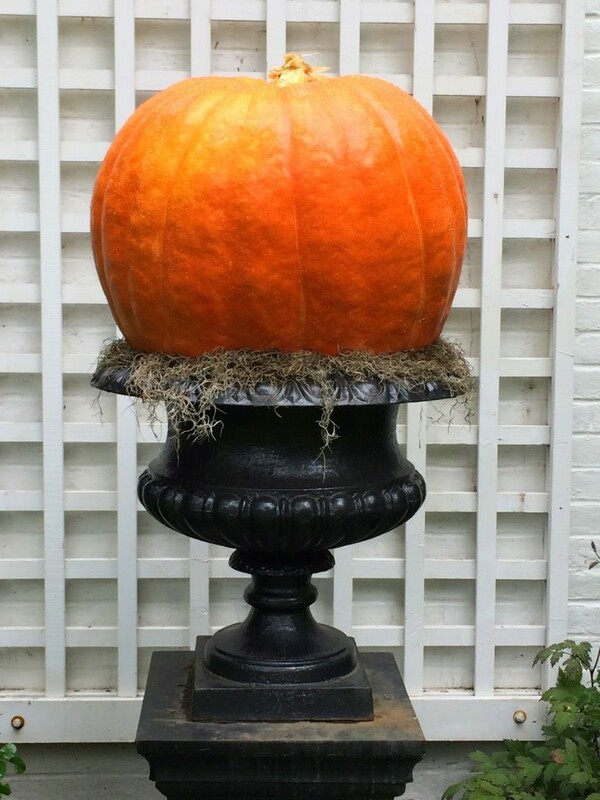 Elizabeth simply adding the orange pumpkins…you are Autumn ready! Beautiful! 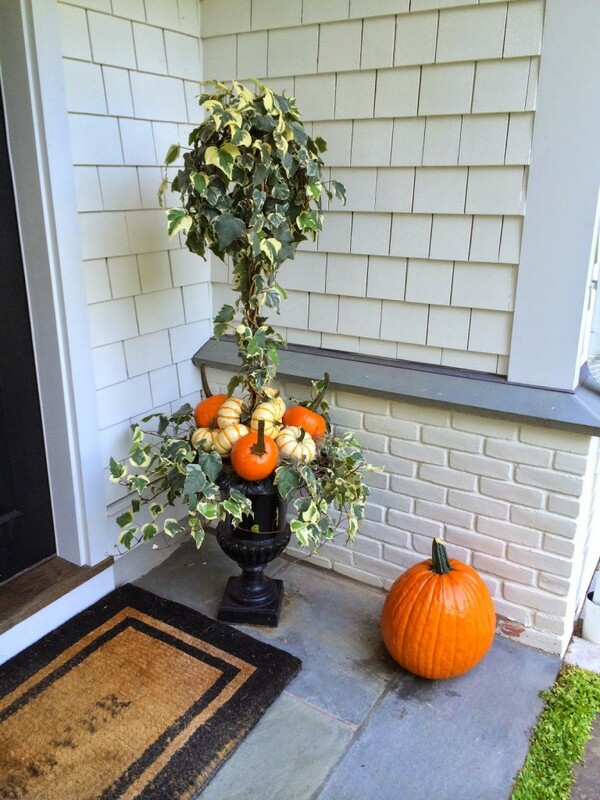 Your Fall touches with pumpkins are brilliant. Your curb appeal is unsurpassed my friend!!! and I know what you mean about sweating in your sweaters!!! The colors of fall are the best! Your home is a classic beauty, and makes me pine for the Northeast. I love EVERYTHING ABOUT AUTUMN, especially around the Hudson Valley where I grew up – apple orchards, pumpkins in fields, apple cider and donuts! !!!! Love your pots! 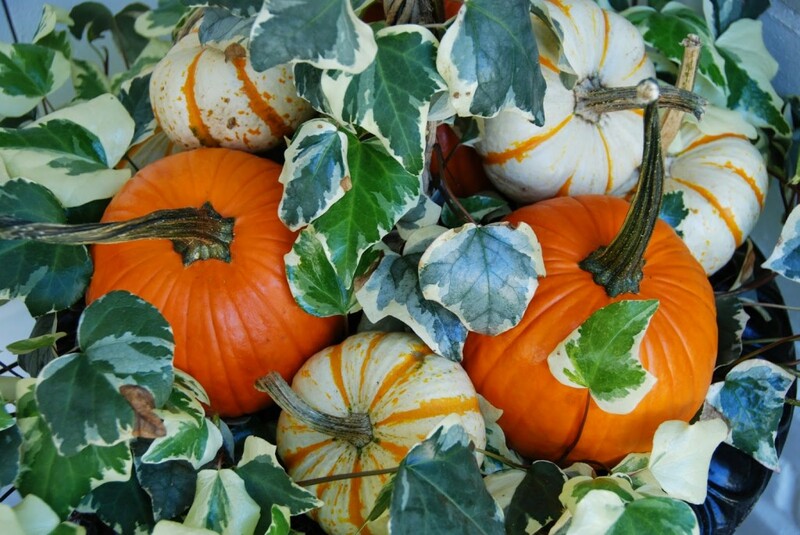 Love the ivy mixed with the pumpkins.. I love fall!! Exactly how Forerunners Wrist watches tend to be Comparable. Just about all Garmin Forerunners longines replica sale tend to be all-in-one GPS NAVIGATION hand models, which means the actual GPS NAVIGATION aerial is actually installed within the view. This really is very unique through additional GPS NAVIGATION view producers for example Timex, Suunto as well as Polar, that need safe a good exterior GPS NAVIGATION gadget for your entire body. Along with Forerunners longines replica sale, you are able to simply place the actual view in your hand as well as you are all set to go. The actual Garmin wrist watches additionally reveal a few incredible secret sports activities view functions. A few are simply present in particular versions, however nearly everyone is contained in just about all Forerunners wrist watches. Beneath is really a longines replica sale these types of discussed functions: Digital Companion Function. The actual Digital Companion function enables you to teach towards are just looking for individual, exhibiting in case your digital "competitor" is actually "ahead" or even "behind" a person. Car Pause/Auto Cv. Breaks as well as resumes the actual stopwatch period depending on your own pace. If you want to cease operating in a visitors gentle for example, the actual view halts the actual stopwatch timer instantly. Car fake omega watches. Much like Car Stop, the actual Car Panel functions instantly information your present "lap" as well as begins a brand new 1 if you have operate the specific range. Easy Routines. Enables you to enter hublot replica sale, range as well as calorie objectives as well as work out towards all of them. On the era about digital knowledge, globalization and additionally e-commerce, man's lifespan has completed being the same kind of phenomenon. This approach starts on the lookout more found, if you will compared the latest life bring back of 25 percent century gone. Apparently, there is more Radio stations beaming out services today, more digital cameras capturing real human forms and additionally nature, and a greater number of replica Breguet watches DVD members and iPods possessing sold than in the past. Man's lifespan has for certain been replica breitling watches moving through a replica watches fast street since everyone began replica IWC watches currently fake Louis Vuitton Luggage in the cutting edge millennium.